Don was one of my best friends. He moved back from DC…came home to deal with his HIV status…oh, sometime in the late ’90’s. I think it was 1996 or maybe 1997. It was a big move. I drove the big rental truck to DC with him years earlier when he moved to Arlington, VA, to assume his new post at the Department of Energy. So, his return was big. He was retired. He was comin’ home. He found a wonderful duplex on 15th street in Tulsa across from The Sophian Plaza where he used to live. It was a great place. It was spacious, a 1950’s style duplex that was very private and provided him a perfect set-up for income property from the other half of the residence. We ended up overhauling the entire place. We had it painted, added stereo and lighting throughout and updated the entire interior. We ripped out and replaced all the old concrete walkways, driveway and front steps and added a raised covered deck so he could see the Arkansas River down the hill. I remember his saying, “Dark and cool. Dark and cool. Those summers in Tulsa can be brutal.” We were setting it up to be the perfect place for him to adapt to the demanding challenges he faced with HIV. As a fledgling designer, decorator, project manager…mostly broke…still cleaning houses and handling garage sales and organizing people’s storage units and basements, I relished the opportunity he gave me. When he arrived, every picture was hung, all the antique furniture and rugs were placed, the black-out draperies were hung and the kitchen was completely functional. I had the lights set, the music playing, and when he walked in, he was home. It was quite the undertaking. A wonderful, creative and demanding experience. I also remember that when he bought the place, there was one lone piece of furniture left in one of the bedrooms. 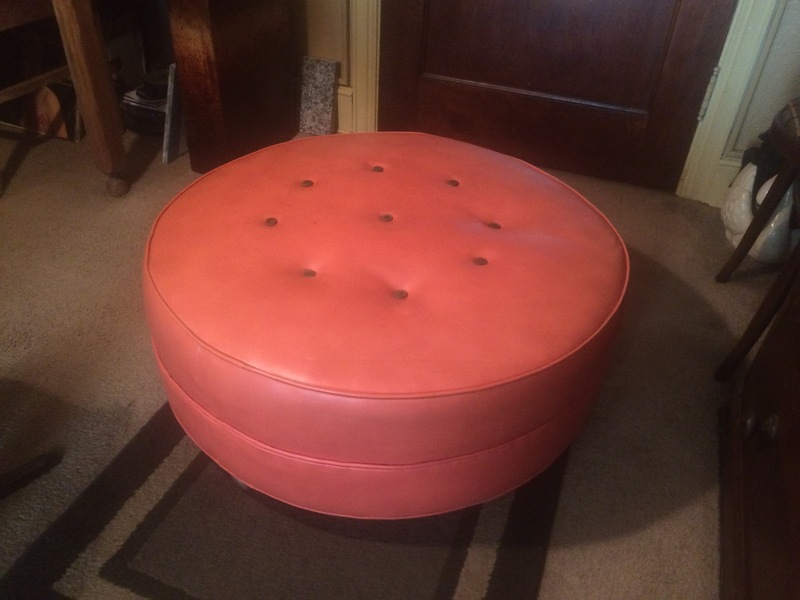 A beautiful, heavy round ottoman upholstered in coral naugahyde. On casters. 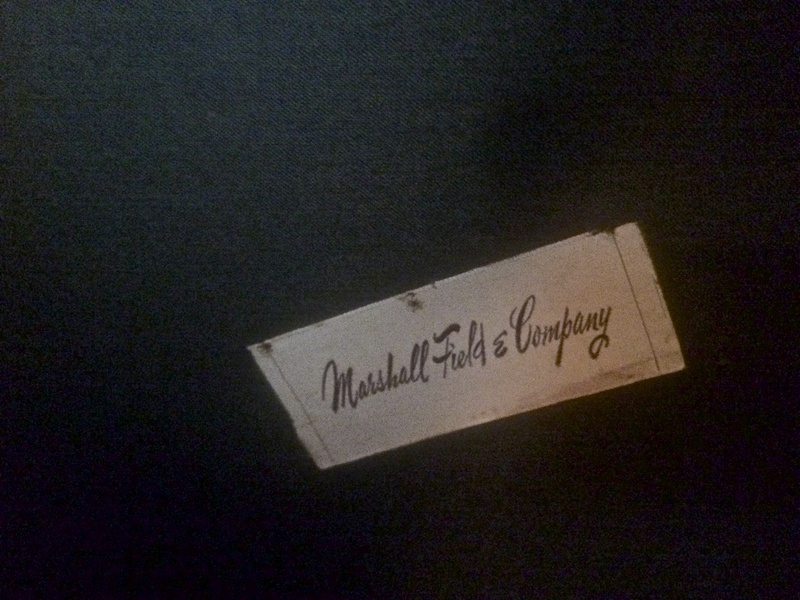 From Marshall Field’s…probably made in the late ’50’s or early ’60’s. “Make sure you get to keep the ottoman when you sign the deal,” I insisted. It was going to be perfect in my retro-themed apartment. It was a true find–one of those things that if you had set out to find it, you probably couldn’t. It was a delightful classic piece to sit in front of my sofa and serve as a cocktail table and leg rest. What a great color, I thought, to sit on my cream and black zebra-print rug. It was one more wonderful, unique element to add to the slow, gradual upgrade of my apartment during the transition years. I loved it. I also remember that he got a ‘built-in roommate’ for the other half of the duplex. She was already a renter, and she was perfect. She worked nights. She was quiet. She was responsible. She didn’t throw parties. So, Don was set. He didn’t even need to find someone to lease the other side. It was so many years ago. There are so many stories. There was so much drama and intensity. Yet, there was so much life in that duplex. That was Don–brilliant, troubled, intense, full of life and love. In what seems now like a flash, he was gone. Like so many others of the time. I started training at Fitness Together in south Tulsa in late 2009. Heather, a friend in the design business, recommended them. It was located on the opposite side of town, but I thought I’d give it a try. I’d been doing my own program for 20 years…it was time for a change. It’s now been almost six years that I head out south three times a week. Every week. Aaron, the owner, trained me for years. When he and Bethany, his wife and also a trainer, decided to free themselves of the franchise, they opened their own studio and Bethany took over the business and my training while he started his new career. I was there when their two kids were just a thought. Now, one of the kids is a toddler and the other, entering school. They were there to hear my tales of my parents slipping away into dementia at the retirement center. I shared stories of my journey through independence after leaving corporate life so many years ago. There’s an intimacy and friendship that develops over time as you work with someone who helps you maintain your body and your health. Bethany is a Taurus like me–like most of my friends, actually–and we get along as if we’ve known each other all of our lives. We share the stories, frustrations and details of our lives as we go through the weekly, monthly, yearly sessions every Monday, Wednesday and Friday morning. Bethany would also share stories of her single life before meeting Aaron. In fact, she bought her first house in a neighborhood near my old house…the one mom and dad bought way back in 1979…during my entitled years. But, it was after I had already moved away. “Isn’t that funny,” we thought, “that we both lived in the same neighborhood.” It was at different times, of course, but out of all the places in town, it was neat that we had familiar stomping grounds in our past. Now my design work is full time…with some great years and some not so great years. But, my little sole proprietorship sustains me. Many times I wondered if the training ‘had to go’ in order to make my budget work. And, every time I considered it, I somehow managed to keep it a priority. I always felt like it was the first thing on the ‘must do list’…not a luxury, but a necessity. Bethany, Aaron and now, Harper and Hayes, their kids, are a regular part of my life. And, there’s pretty much nothing we don’t tell each other. Or, so we thought. It’s been a summer of renewal and awakening. I took my first trip back to Wisconsin in eight years to visit relatives and to disperse mom and dad’s ashes in the waters of Green Bay. It seems as though all I’ve done is read and do research and soul exploration this summer. I have some nice small projects going, but it is the first time in ages that I haven’t been wrapped up in an intense design project or two. I’m just going with the flow as I’ve done all these years. It’s an interesting, albeit challenging summer at the same time. Fortunately, last year’s incredibly intense triple project workload afforded me this year’s summer break. Now, mind you, I do experience some moments of worry and I wonder what’s next. As the coffers empty, it’s natural for me to go through my ‘fear stage’ about the future once in awhile. My head asks the questions, “What are you going to do?”, and “Should you do something else?”, and “Was this a good idea to be completely on your own…should you have a connection with a support mechanism? !” My soul says it’s okay, go with it. It’s all part of my journey which, actually, has sustained me nicely regardless of my worries. One day in the middle of summer, I decided to hang out a little longer than usual at the studio after my workout. I had no pending meetings or obligations so I figured, heck, why not chill and take my time. Bethany had already started training Karen, her next client. I remember Karen from the other studio. We hadn’t seen each other in a long time…her scheduled appointments are on a different day than mine are. Today, her schedule had changed. I took my time putting on my street shoes, getting ready to leave. In disbelief, I said, “What?” Here was the renter from the other side of the duplex? Here was the perfect roommate that Don talked about? I’ve been in her side of the duplex when we had to fix the kitchen counters. I’ve been in her space while she was at work. Oh, my, I thought. How could this be? After all these years, we were all stunned that we shared such a significant connection in our past. We made the typical ‘what a small world’ comments and ‘six degrees of separation’ observations. We all thought it was odd, though, because we did not share any network of friends, family or workplace relationships. We were just three people in South Tulsa discovering our connection years after it was made. You know, what may not seem that important to someone else, to us became something special and important. How on earth could Bethany be the very person that ‘came along with the property’ way back when? It was such a significant turning point in my life back in the ’90’s–one of the first really big projects I had undertaken…and I’m now hearing stories about the ‘girl next door’ from so many years ago that has been part of my life the last five years? And Karen is the daughter of the guy who sold it to Don? Are you kidding me? My stories that day were from Don’s perspective. He would carry on about the negotiating process when acquiring this ‘perfect place’ for him and was thrilled he didn’t have to find a renter. Karen’s stories were about her family finally deciding to sell it, her dad handling the process and that they wanted Bethany to be able to stay in her home. More details revealed that the first house Bethany bought…over in our old shared neighborhood…was the house she moved to when she finally moved out of the duplex. It was so cool to realize that there’s a thread throughout life that connects us when we’re not even aware of it. It was just so cool. We three were a bit dazed, surprised that this particular day of changed schedules, this particular conversation, this particular moment was given to us reminding us that there are no coincidences. There is no randomness. There was an odd sense of ‘knowing’ and comfort that we all experienced. The feeling is subtle, but it’s there. It makes for a great story. It makes for a wondrous thought. And, frankly, the whole experience was oddly calming. After the ‘wow’s’ wore off, during the ensuing weeks, Bethany and I would often stop for a moment, look up and ask, “Wait, you knew Don?” But routine and normalcy eventually take over and you go back to the regularity of Monday, Wednesday, Friday. Weeks later, one day Bethany tells me that Karen had a question for me about a piece of furniture Donald had ‘since you were his designer.’ I thought it funny. I never considered myself his designer at the time, more as a person who put the puzzle pieces of his home together. It was his furniture, his art, his collectables. It was his taste. I remember laughing and telling her, “Oh, my, I have no idea what happened to all of his stuff. His family took over.” I do remember Bethany showing me a picture of an antique recliner he had given her. But, the rest of it? I had absolutely no idea. “Say what?” I’m thinking. Did she seriously just ask about the coral ottoman from Marshall Field’s? Come to find out, it had been a running joke in Karen’s family throughout the years. Her dad wasn’t supposed to have given the ottoman to Don…it was supposed to go back to the lake house. The family was upset with him when they found out. They had the sofa, the chairs, the tables and were missing the ottoman. They inherited the set from one of their relatives. It had all been in the family a long long time. Original matching vintage sets in good condition are not easy to come by and they let their dad know it! I was amazed, of course, that out of all of the questions I could be asked, it was about the coral ottoman. Gosh, our story just got better by her asking about it. What a web we weave! I wondered whatever happened to the thing. Did I give it away? So, I decided to check out my storage closet in my old brick apartment building built in 1928…closets tucked away for the residents in the recesses of the basement. I don’t remember seeing the ottoman. I only hit the closet once a year to grab holiday decorations. It’s dark down there. The closet is crammed. I wasn’t about to tell Karen or Bethany that I was going to look for the ottoman. I didn’t want to get their hopes up. I honestly couldn’t remember if it was still in there. I finally found the key to the lock, opened the door, and using my phone’s flashlight started looking. Well, by God, as if peering out to see me, I spot a bit of coral naugahyde. Tucked in the corner with boxes stacked high on top of it. It was there. The ottoman was there. “Of course I didn’t give it away,” I thought, realizing that I surely planned to use it again someday if I ever moved–and, of course, that I really don’t get rid of anything that’s cool. I was so happy it was there. I removed all the boxes, pulled it out, cleaned it up, took some pictures and loaded it into the car. Anticipating Karen’s response, I only let Bethany know it was coming. I placed it close to the window next to some exercise equipment at the studio. It’s a bit time-worn. I prefer to think it has character. But, the overall shape is pretty good and the color is good. There it sat in its aged glory waiting to go home. The next time Karen had a session, she loaded it up. Beaming. 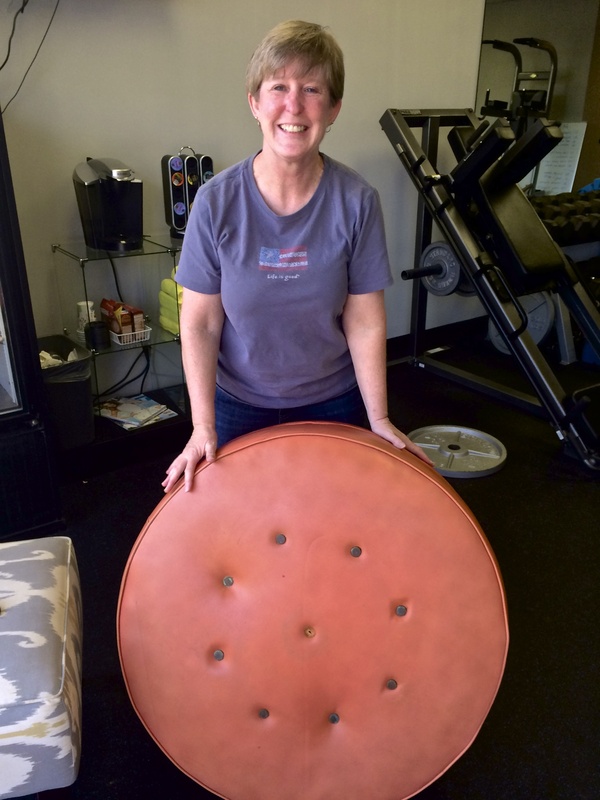 Karen and her family finally got the coral ottoman from Marshall Field’s back where it belonged…with its matched set of furniture. Her mother is overwhelmed. “What do you mean, you found the ottoman?” she asked Karen. The family stories continue. The last chapter to their unfinished story is written. They never thought there would be a last chapter or that they would ever know what happened to the ottoman. Their only regret is that their dad was already gone, but we all agreed that something tells us he knows. Let’s think about this for a moment. What are the chances? What does it mean, if anything? 18 years ago my friend bought a duplex that came with a roommate. 18 years later I realize the roommate is my trainer and that I’ve met the daughter of the man who sold the duplex to him. 18 years ago my friend gave me a piece of furniture from that duplex. 18 years later, I return the piece of furniture to the family who left it in the duplex. And, it all started on a day when the schedules changed and the moment of sharing a story unfolded because I didn’t rush out of the studio. Yeah, right, it sounds pretty crazy. The significance does not lie in a small piece of furniture… a funny story of coincidental occurrences–random luck and unfathomable circumstances that lead to a simple “Gosh, that’s weird” reaction. Instead, it shows us that a seemingly unimportant event, decision or choice made many years ago can come back to us to remind us and teach us that nothing is random. It reminds us that all things are connected–we are all connected–that the connections are very real and that there really are no coincidences. The storyline we create is like a thread of life we all sew together to create a wavy, gauzy blanket wafting in the wind, light flowing through it, wrapping itself in itself and unfolding when the breeze is just right. The blanket gently folds over itself and connects to other points on itself depending upon that soft breeze. It is in motion at all times regardless of time. The timing was just right for all of us involved in the ‘miracle of the ottoman’. For me, during a summer of awakening it helped me let go of my fears and worries about what’s next. It has helped me trust that the decisions I made long ago and even now are the right ones, that I am exactly where I need to be in my life–that trusting my instincts will lead me to the right place and people in life. The timing was impeccable and important to me this summer in particular. At any other time, it might not have left such an indelible impression. It also reminded me to remain calm and to chill once in awhile. It is also a story for all of us to realize that everything will be revealed when the time is right. It is a story to remind us that each choice we make, each decision we make–even the small ones–fit into a much grander picture beyond our wildest imaginations if we open our hearts to feel it and we open our eyes to see it. It is a story to remind us that we have no need to worry or to control everything in our life because there is something much much greater happening all on its own–without our help or machinations. I hope all of us are lucky enough to see our stories unfold in that ‘random’ occurrence–the unlikely ‘coincidence’ of a friend, a chance meeting–a memory–that reminds us of the connection to the big picture with an assurance for us that all is well in our lives. Each thread we sew in the blanket of our lives is interwoven with everyone else’s threads at the same time. And, we are all using thread from the same spool.